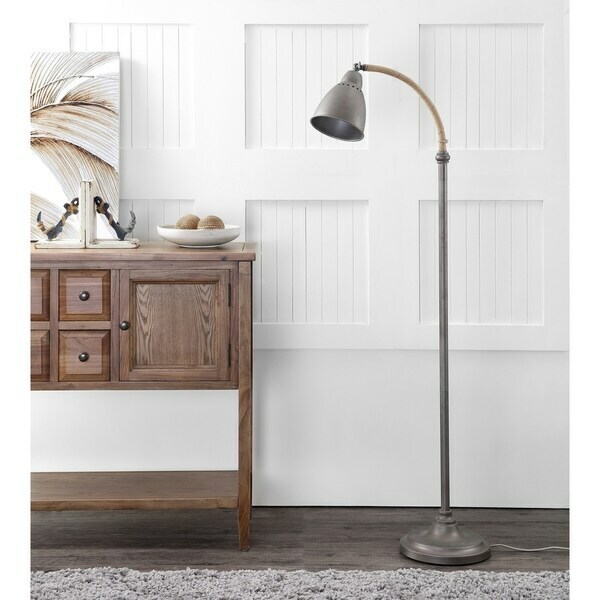 This lamp is a quality lamp with great rustic style. I especially like the rope at the neck of the lamp. I was looking for a reading lamp with a more on-trend for my newly decorated bedroom. Would have given it more start, but the floor button is in the middle of the cord , and I would have preferred it to be closer to the base. Other than that I am happy with my purchase. Safavieh Lighting 60-inch Naldo Floor Lamp - Grey - 21" x 10.375" x 60"
Safavieh Lighting Toria 57 Inch Floor Lamp - Black - 14.5" x 9" x 57"
SoHo's latest lounge inspired this industrial chic floor lamp. Complete with rustic rope detail, this modern spin on the traditional pharmacy lamp features metal construction finished in dark grey. Ideal by a reading chair in the living room or office. Dimensions 10.38 In. X 21.0 In. X 60.0 In. I love this lamp! It was just the look I was after. The quality seems to be very good and it looks great in my sunroom. And it was very easy to assemble. Safavieh Lighting Greyson 57 Inch Floor Lamp - Grey - 11" x 9" x 57"